christmas is my least favorite holiday. in fact i hate it. i could go on for hours as to why i hate christmas, but i won't. there's only one thing that i like about it, and that is the ornaments. especially vintage ones. 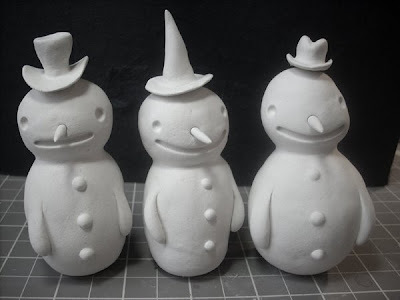 here's some snowmen i made for earth angels this season. this might help you get in the mood next year! I spray painted a plastic tree black and we cover it in purple lights and hang little eyeballs on it with little skulls, black cats, and little skeletons ! It's ok to hate chrapmas ! We wrap all of our presents in purple, green and black paper ! It creeps people out and we love it ! 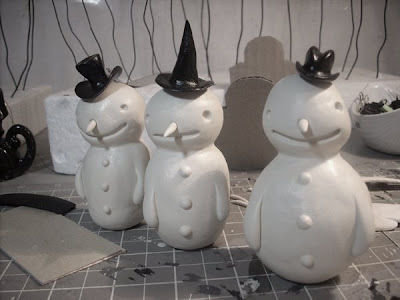 I love the snowmen and think you did a great job as always !!!!! What's up ? I have been using some new clays this weekend with bad results !!! AAHHHH I tried a porclein clay that was $$$$ and it cracked up like crazy ! I love the paper clay they sell at michaels but I have to be held hostage as too when they will get more in ! I am going to try and crackle the varnish instead of the paint and see how it goes. 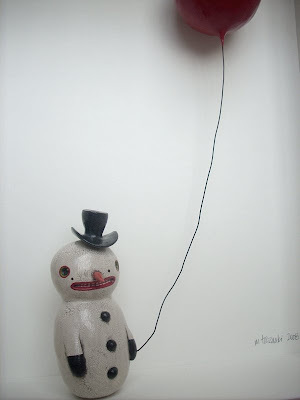 My puppet class is being posponed because of all our snow !!!! It's ok I want to go to seattle and and see some old puppet buddies ! Hope to hear from you soon on tips ! 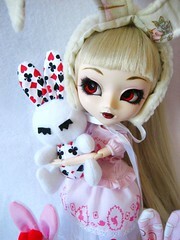 Your a doll !!! I do like your work! I found a link to your blog from It's a Whimsical Life (http://itsawhimsicallife.blogspot.com/), and I'm glad I did! 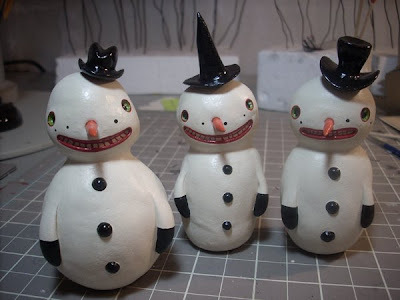 I also don't like Christmas, though I DO love your snowmen! If I ever DO ge around to decorating for Yule in the future, I plan to use only natural materials (evergreen, sumac), and very little of it.